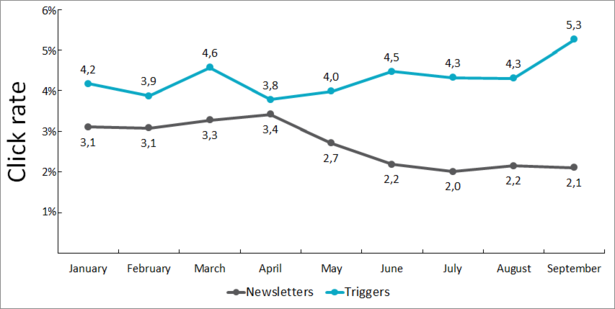 Do you know how well your email marketing campaigns are performing? There are some important metrics that you should be measuring on a regular basis if you want to maintain email list health and improve the ROI of your campaigns. In this guide, we’ll show you how to measure the effectiveness of your email campaigns. In fact, email marketing has an ROI of 4300%! So are you using email effectively? What are the right metrics that you should be measuring? First, we’ll discuss what those important email marketing metrics are. We’ll show you exactly how to calculate them, how often you should be tracking them, and what factors can affect them (either positively or negatively). Second, we’ll share how to benchmark your current email marketing performance and set realistic goals so that you know where you are starting from, and where you would like to be. Finally, we’ll share the important variables to test so that you can improve the effectiveness of your email campaigns. There are 9 important email marketing metrics that you need to be measuring on a regular basis. Some of these metrics need to be monitored on a weekly basis so that you can tell ahead of time whether any given campaign is going to hit it out of the park, or fall short. By finding this out early on, you’ll be able to “pivot” as needed to meet your revenue goals (by pulling out a backup campaign, for example). Other metrics need to be measured on a monthly basis. This way, you’ll be able to determine which campaigns you need to have on your calendar for the coming months, or how you need to adjust the campaigns you already have planned. Your open rate is the percentage of your email recipients who opened your email. This is an important metric to measure because your email campaigns won’t do a thing unless your subscribers are actually opening and reading them. Factors: There are a couple factors which can affect your open rate. The first is the sender’s name, and the second is your email subject line. For tips on improving your open rate, check out 10 Easy Ways to Improve Your Email Open Rate. Your click through rate is the percentage of your email recipients who clicked on a link inside your email. Most of the time, getting your subscribers to click on a link inside your email will be the main goal of your campaign, so this is an important metric to measure. Factors: Your click through rate will be affected by the anchor text on the link, as well as the location of the link in the body of your email, the number of times you included the link, and even the copy leading up to the link. For help improving your click through rate, check out 7 Things You Can Do to Significantly Improve Your Email Click-Through-Rates. Your unsubscribe rate is the percentage of your email recipients who clicked on the “unsubscribe” link inside your email. Factors: There are many factors which can affect your unsubscribe rate. Unsubscribe rates can be high when you don’t have a strong welcome series, if your “from” name isn’t recognizable, if you use misleading subject lines, if you don’t email frequently enough, or if you email too frequently. 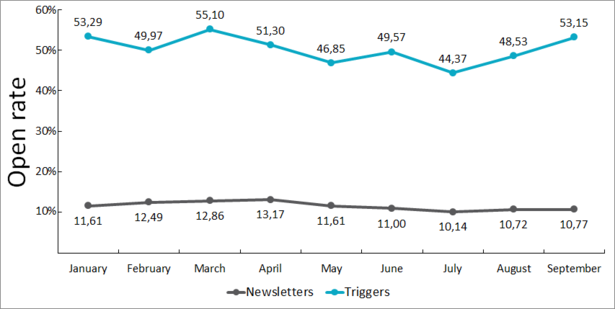 Check out our guide to reducing email unsubscribes rates for more tips. 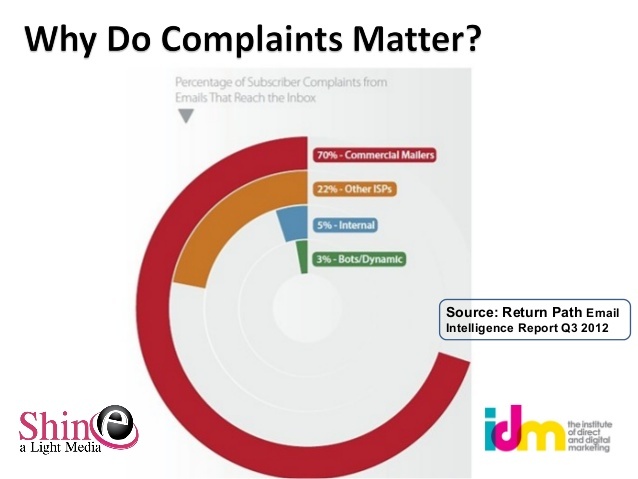 Your complaint rate is the percentage of your email recipients who marked your email as spam. Factors: Reasons for high complaint rates include using purchased email lists, not including an unsubscribe link in your emails, sending irrelevant content, stale email addresses, and emailing too frequently. Your conversion rate is the percentage of your email recipients who completed your desired action (e.g. purchasing a product). Factors: There are many factors which can affect your conversion rate, depending on what a successful conversion is in your particular campaign. If a conversion is a successful action that happens on your website after someone clicks on a link inside your email, you’ll want to make sure that your website is optimized for conversions. Check out our Beginner’s Guide to Conversion Rate Optimization here. Your bounce rate is the percentage of your total emails sent which weren’t successfully delivered to your recipient’s inbox. Factors: Emails can bounce due to a non-existent email address, if the receiving email server is unavailable or overloaded, if the recipient’s mailbox is full, if the recipient is on vacation with auto-reply, or if the receiving server has blocked the incoming email. Your forward (or share) rate is the percentage of your email recipients who forwarded your email to a friend or shared your email by clicking on a share button inside your email. This may not seem like an important metric to measure, but it’s a really good thing to try and increase. If your existing leads are forwarding your emails, that means they are actually becoming ambassadors of your brand and generating new leads for you. Factors: Nurturing your email list is the biggest factor here. Don’t forget to nurture and reward your existing customers. Your campaign ROI is the overall return on your investment for your email campaign. Factors: The above formula to calculate campaign ROI is actually a pretty simplistic method, and measuring your true ROI can be tricky. For instance, it’s really tough to know when to measure your results. One email marketing campaign today could affect your results a month or even a year from now. To learn more about the factors which affect your ROI and the ways to measure it, check out this guide on How to Measure the ROI of Marketing Programs. Your list growth rate is the rate at which your email list has grown over a certain period of time. Factors: If your list isn’t growing, it’s dying. Not only do people unsubscribe, but email addresses tend to go “bad” over time due to people switching email accounts and abandoning the old one. Make sure you are constantly building your list, and keeping your unsubscribes at a reasonable rate. OK, now that you know the important email marketing metrics you should be tracking, let’s take a look at how to set benchmarks so that you can set realistic goals and measure your improvement. Benchmarking your current email marketing performance is crucial if you want to measure the effectiveness of any campaign. You simply have to establish a baseline if you are going to truly understand what any of these numbers mean for you. First, go back to your old broadcasts from the past 3-12 months and chart the above metrics. At the minimum, you should be charting your open rates, click through rates, unsubscribe rates, complaint rates and forward rates. Next, calculate the average of each of the metrics you charted in Step 1. Simply add up each of your values for each metric, and then divide that number by the total number of email campaigns sent during that period. So for example, if I sent 3 campaigns that received 21%, 23% and 42% open rates respectively, my average open rate would be (21 + 23 + 42) / 3, or 28.67%. Now you’ll want to take a look and see where any outliers are. Once you know what your average open rate is, for example, you can see whether there were any particular campaigns which had an unusually high or low open rate. 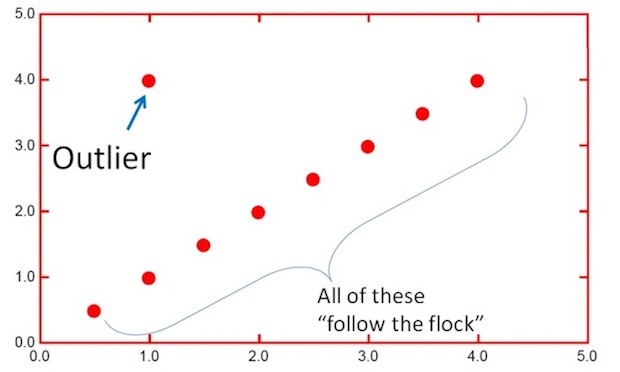 Take note of these outliers. Do you notice any patterns? Does a specific topic do really well? Perhaps sending at a particular time of day does better or worse? Take note of any patterns that emerge and use these to improve your future campaigns. Finally, you can set baseline numbers and goals for each of your email marketing metrics. This way, you’ll be able to judge whether any given campaign performed better or worse than you expected. You’ll also be able to repeat what worked, or ditch what didn’t work. For example, let’s say one of your emails had a open rate that was well above your baseline. You would want to take a look at that subject line and think about why it did so well… maybe it was the type of subject line, or the topic that your subscribers responded to? Now that you know what works, you can create more subject lines like that in the future. Now that you have set your baselines and goals for each of your email marketing metrics, let’s look at a few key variables that you’ll want to test to improve your campaigns and reach your goals. So now you have set benchmarks for each of your email marketing metrics, and you know what “normal” numbers look like for your particular email list right now. But you may be wondering: what if you aren’t happy with those numbers? How do you actually go about improving each of those metrics? The time when you send your emails will have an effect on your open rates. If you send your emails at the wrong time, such as when your subscribers are “purging” their inboxes, you’ll see much lower open rates than you should be. As a general rule, it’s a good idea to avoid the early morning, the lunch hour, and after work because these are the times when people are likely to be cleaning out their inbox. That means you are probably safe to send emails between 8:30-10:AM, 2:30-3:30PM or 8:00-midnight. However, your best send times will vary from one email list to another, so test sending emails at different times of day and track your open rates. For more information, check out our in-depth guide on The Best Time to Send Emails (Here’s What Studies Show). The topic of your email can have a huge effect on your open rates, click through rates, and unsubscribe rates. As a general rule, make sure that you are tagging and segmenting your email subscribers by interest, so that you can send them topics that are the most relevant to them. At the minimum, you should be tagging new subscribers based on the lead magnet they downloaded. You can use OptinMonster integrated with any major email provider which offers tagging to do this. There are also many other ways you can segment your list to increase the relevancy of your emails. Here are 50 Smart Ways to Segment Your Email List Like a Pro. Even after you’ve segmented your email list, you’ll still want to monitor which topics your subscribers respond to the best (and which topics they don’t resonate with). This will give you important insights into how to create better content and better products for your subscribers and customers. Direct subject lines are simply that: direct and to-the-point. These subject lines focus on the big benefit that the recipient will get from opening the email. Curiosity subject lines don’t tell you exactly what you’ll get when you open the email. Instead, they say just enough to make you curious, but you’ll have to actually open the email to satisfy that curiosity. For many more subject line ideas, check out 101 Best Email Subject Lines to Boost Your Email Open Rates. You’ll also want to test the actual anchor text for your links, since this will impact your click through rates. To make your calls to action even more compelling, try adding power words to them. Power words are words that copywriters use to trigger a psychological or emotional response. For a comprehensive list, check out these 700+ Power Words That Will Boost Your Conversions. That’s it! In this guide, we showed you the 9 important email marketing metrics to measure, when and how to track them, and what to test to improve them. Now it’s your turn. Go ahead and look at the state of your email marketing performance right now by following the 5-step benchmarking process outlined above. Then, you can set some goals for improvement and keep track of your progress on a weekly and monthly basis! If you enjoyed this guide, you may also want to check out 19 Quick and Dirty Tricks for Writing Better Emails, as well as our Complete Guide to Email Marketing. Great article! I’ve picked up several points that I think will make me much more efficient with my email marketing.I am using tool called Easysendy Pro which helps me with email marketing. Great post! Like what I’ve read from another blog, if you aren’t getting clicks, you’re wasting your time. If you’re still sending mass emails without updating your strategies, you’d noticed that results are disappointing, despite your efforts in updating your mailing lists and creating emails. Thanks for sharing! Thanks for your input, Brooke. 🙂 You might also enjoy our recent article on email marketing statistics. Don’t forget to follow us on Twitter to keep up with our articles as they’re published. Good primer for new email marketers. The 4300% ROI is a stat that doesn’t get nearly enough play in the marketing press. In open rates (subject line is the other of this dynamic duo). That’s all the recipient can see before the open. The other thing I’d emphasize is the header copy. It’s precious real estate. Use it accordingly.